The Marine Corps does not put near as much money and effort into Quality of Life programs as do the other services. Part of the reason is that the Marine Corps is the smallest military service under the Department of Defense (DOD), and often get screwed on their funding. Another major reason is the attitude of senior Marine Corps leaders, who apparently feel that "hardship" makes better Marines -- especially junior Marines. This policy is the event of how the Marine Corps handles barracks for junior enlisted. 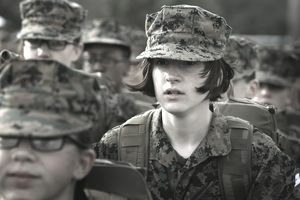 While all of the other services are working on programs to give a private room to all of their junior enlisted members, the Marine Corps specifically asked the Secretary of Defense for a waiver to this policy. The Marine Corps plan calls for two junior Marines (paygrades E-1 to E-3) to share a room and bath, to "support the tenets of team building and unit cohesion." E-4s and E-5s are to be assigned private rooms. More than any other service branch, the Marine Corps follows the RHIP (Rank Has Its Privileges) concept -- even when off duty. I remember one time when I was returning from leave (vacation) to Edwards Air Force Base, and I decided to stop at Twenty-Nine Palms (a Marine Corps base) to get a quick haircut before returning. I entered the exchange barbershop, took a number, then waited for my turn. When my turn came up, I got up and walked to the empty barber chair. As I reached the chair, a person (in civilian clothes), who had just come in a few minutes before, intercepted me, and said, "Excuse me. Are you an officer?" I said, "No. I'm an Air Force First Sergeant." He then said, "Then you'll have to wait. I'm a second lieutenant." He then pointed to a sign that I had missed that said, "Officers Have Priority Over Other Customers." No other service, in my experience, takes RHIP to this level, especially in a non-appropriated funds (NAF) activity. Marines who are authorized to live off base at government expense, and those who live in family housing, receive a monthly food allowance, called BAS. Those who live in the barracks/dormitories do not normally receive this allowance, but eat their meals for free in the on-base dining facilities (chow halls). Want to read more about the pros and cons of choosing the Marine Corps? Interested in the pros and cons of the other military branches? Is the Marine Corps Right for You? Is the Air Force the Best Branch for Quality of Life?